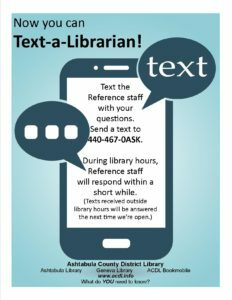 You can text the library’s Reference staff with your questions. Just send a text to us at 440-373-8974. (NOTE: This is our new number. Please delete our old Text-A-Librarian number from your contacts.) During library hours, a Reference librarian will respond within a short while. We’ll answer texts received outside library hours the next time we’re open.